Purchasing subscription licenses, or renewing license maintenance ? The license utilization chart is a powerful tool for assessing the efficiency of license utilization in the organization. This is especially important for customers who are contemplating the purchase or renewal of subscription license (e.g. Autodesk subscription licenses) or renewing license maintenance. Click the EasyAdmin ‘Start’ → ‘Management’ → “License Utilization” menu item. Detection of abnormal usage patterns: Where did these licenses go ?! If the “Show aggregated” box is checked, the chart will present the aggregated percentage of usage, i.e. each point (x,y) answers the question: “What is the percentage of usage time (y) that AT LEAST a given number of licenses (x) have been in contemporary use. At least 0 licenses have been in contemporary use 100 % of the time. This form of presentation filters out temporary usage peaks, and provides insight on the actual number of licenses required to support the current level of activity. 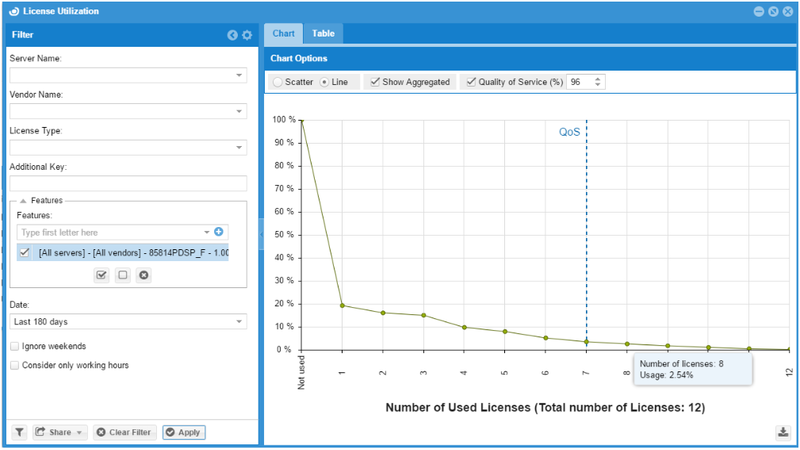 If the “Show aggregated” box is NOT checked, the utilization chart will present a histogram of license usage. That means, in reference to the x & y chart axes, that each point (x,y) answers the question: “What is the percentage of usage time (y) that an EXACT number of licenses (x) have been in use contemporarily”. Exactly 0 licenses have been in contemporary use 81% of the time. Note that this algorithm produces a non-monotonous function (e.g. the value for 3 contemporary licenses is higher than the value for 2 contemporary licenses). The aggregated presentation is of a monotonically decreasing function, which plainly presents the number of required licenses. Pertaining to the example presented in figure 1, there have never been 12 licenses in contemporary use within the past 180 days. 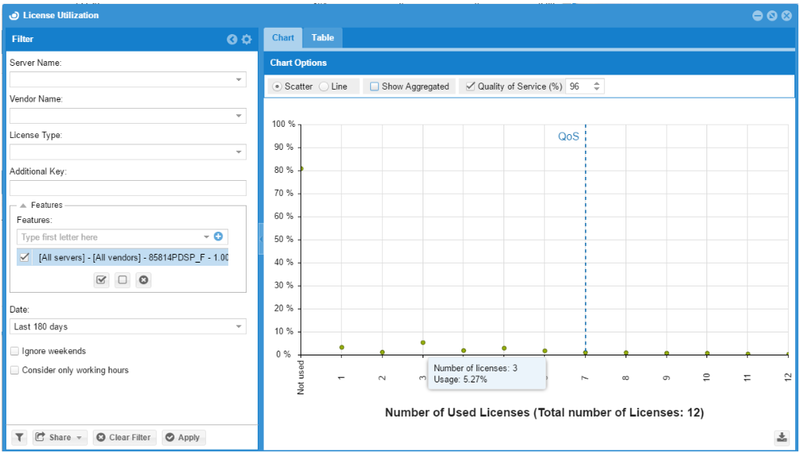 The Quality of Service (QoS) parameter is the percentage of configurable required license availability, as defined by the license administrator. In order to support 96% of license requests, the organization would only need 7 licenses. Having procured 12 licenses means that the organization owns 5 redundant licenses. This information is crucial when considering license subscription renewal, additional license procurement, or license maintenance renewal. By comparing the the two formats presented in figures 1 & 2 (w/wo the “Show Aggregated” check box), one could notice ‘blips’ in the utilization chart (e.g. for the value of 3 licenses). These ‘blips’ may indicate abnormal usage patterns, such as long forgotten active sessions, or offline (‘borrowed’) licenses.